Note the distinctive white breast and brown flanks of this Male Shoveler, at times the dark green head can look almost black. 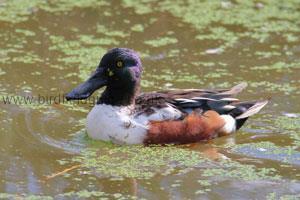 The Male Shoveler is a distinctive bird with a large heavy bill, dark green head and brown flanks. Even in eclipse or juvenile plumage the large bill and long neck are usually enough to identify it. The Shoveler is a surface feeding duck. Breeds mainly in Eastern Europe. Around 600 pair nest in the UK with numbers rising to 18,000 in the winter. Also known as the Northern Shoveler. Feeds on the surface of the water often by sweeping it's bill from side to side to filter the water. The Shoveler breeds in reedy freshwater pools. In Winter it is much more widespread on freshwater pools and marshes but can also be found in sheltered estuaries and creeks. 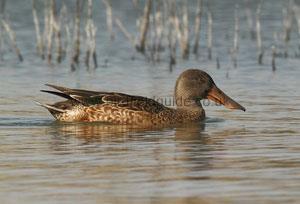 The female Shoveler has a light brown streaked body, the large heavy bill and long neck are distinctive. In Summer the Male Shoveler is more like the female, however he has a darker head and the flanks are still slightly Rufous. The back is also darker than the female.